Open wire construction permits air circulation, sprinkler penetration and reduces dust. The snap-on compression sleeves allow easy adjustment of the shelves in 1" increments. Greenguard certified. Shelf capacity of 1250 lbs. 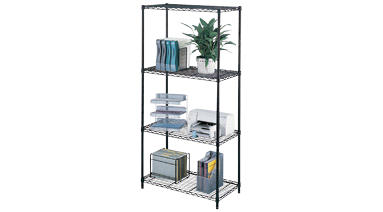 36"W x 18"D x 72"H. Includes 4 wire shelves and 4 posts. Ready to assemble. Black.